They're thick and they're stickers. They're Thickers! 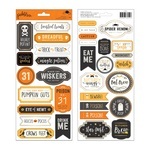 Add style and dimension to your projects with thickers stickers. Thickers are made of archival quality adhesive-backed vinyl and feature a variety of cool new fonts and colors.